When you’re packing on muscle and building up your testosterone levels, it’s not all about lifting heavy and protein shakes. It’s also about having a solid nutrient profile, and hitting your body with everything it needs in order to grow – and a good way to do that is supplementing Vitamin B6. Also known as Pyridoxine, Vitamin B6 not only benefits your testosterone levels, but can also lower the production of the female hormone estrogen in the body. Regular supplementation of the vitamin not only supports your hormones, it also helps your body in general, promoting the health of the eyes, hair, skin and liver. There are numerous sources of where you can get Vitamin B6 in your diet, however, getting enough of it is the real issue. You can find Vitamin B6 multiple food groups, from tuna fish to sunflower seeds, this vitamin is in a range of meats, non-citrus fruits and vegetables. However, failure to get the optimum amount of this vitamin can lead to problems like anemia, skin disorders, depression and being more prone to infections. Regular supplementation of Vitamin B6 is a good way to make sure your testosterone levels stay elevated. Studies have shown a deficiency in the vitamin leads to a decreased rate of testosterone synthesis in subjects . Making sure you get enough of it ensures healthy testosterone levels and a better chance of having increased muscle growth. B6 has also been shown to help with the reduction of estrogen in the body. Vitamin B6 has been proven to have an effect on multiple steroid hormone receptors in the body. In some studies, adequate supplementation of the vitamin reduced estrogen-induced gene expression by 30% . With less of the female hormone, testosterone has more of an impact in the body and helps towards muscle gains. 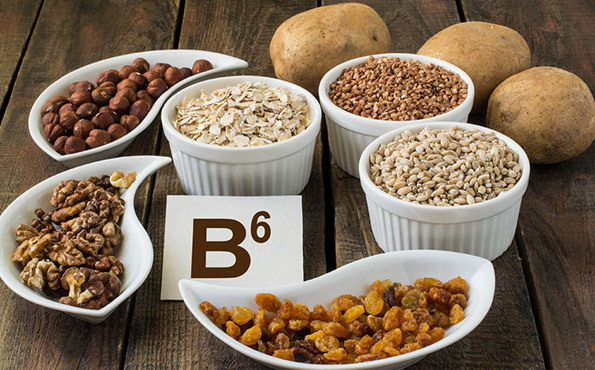 For other uses Vitamin B6 has been used to treat depression, arthritis and even contributes to the strengthening of your body’s immune system. It is an essential part of your diet – without it you’ll be unable to perform at full capacity, whatever your goals. 250% of your daily Vitamin B6 requirements can be found in TestoFuel. This ensures that your body has everything it needs to help you get the physique you deserve without having to worry about any deficiencies holding you back. This is just the tip of the iceberg, if you want to see the full extent of what TestoFuel can do for you, be sure to check out our ingredients page for the whole story. Allgood V.E., Cidlowski J.A. Vitamin B6 modulates transcriptional activation by multiple members of the steroid hormone receptor superfamily. J. Biol. Chem. 1992;267:3819–3824.